Earlier this month we introduced our March Book Club title, Get Bold: Using Social Media to Create a New Type of Social Business, by Sandy Carter. Thanks to our book club partner Pearson Publishing, we were able to send copies to several of our chapter leaders and Professional members to review on our behalf. Thank you to our reviewers Chris Craft, Jeannie Walters, Erno Hannink and several others shared their reviews on this title. A big thank you to Sandy for joining us for a members-only webinar yesterday to share a deeper dive on Get Bold and answer participant questions. If you missed the webinar, Sandy shared her slides below, along with webinar audio. Congrats to webinar participant Ali Sabkar, President of SMC Bahrain who won a free copy of the book for attending the Get Bold webinar. To purchase your copy of Get Bold, please visit Amazon. 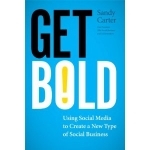 Be sure to connect with Sandy to continue the conversation and discuss her book Get Bold on Twitter @Sandy_Carter. If you’re a Professional member or chapter leader and are interested in participating in a future Book Club review, email Jessica @ socialmediaclub dot org for details. We have some excellent titles scheduled through 2012 and always looking for professionals to review on our behalf.